Former Screaming Trees frontman Mark Lanegan returns after 2004's release Bubblegum. 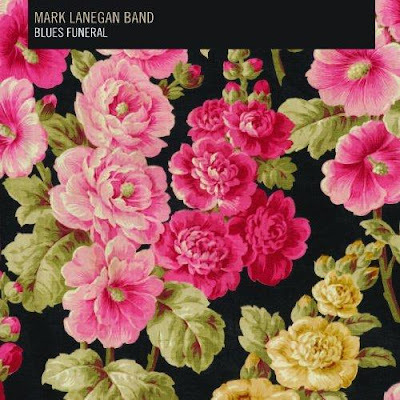 Once again teamed up with producer Alain Johannes, Blues Funeral is another respected Blues Rock work of art with Lanegan's distinctive baritone vocal collaboration with familiar artists such as Josh Homme and Greg Dulli. You might know him for his work with Queens of the Stone Age back in 2000's release of Rated R. His rough scratchy vocals beats the idea of every anti-smoking campaign and puts the attractiveness on this old man. He is one of those vocalist that you'll either love or hate. I don't think there is a chance for an in between. The bass intro thumps into the first track and single, "The Gravedigger's Song" as a clear-cut Lanegan track similar to his previous works with the Queens of the Stone Age. A slightly mellower following track, "Bleeding Muddy Water", is not a lyrically complex song but musically, as a whole, this album does some justice. Lanegan's collaboration as a band with Greg Dulli in The Gutter Twins was one of the best work he did, and they're often back together doing a track or two. Dulli did a brief appearance on "St. Louis Elegy" and even though the collaboration was just a simple backup vocal, it would serve as the icing on the cake for me as it is for most fans. Much similar to "Riot in My House" which features former bandmate Josh Homme on guitars. Most people anticipates this moment be it with Homme's own band or Lanegan's. Halfway through, the tracks start to get less organic as electronics begin to take form as the backbone to the tracks, especially for "Ode to Sad Disco". Lanegan has accomplished a new direction on electronics for the first time with this daring approach. The synthesizers and drum machines are still quite subtle as compared to the conventional instruments that he normally uses even though at times it gets brought out to the forefront in the music. "Tiny Grain of Truth" is another example of an Electronic track with a subtle addition of guitars. The album is musically very appealing and a job well done for Lanegan. His vocals are one of the reasons why I would continue to listen to Mark Lanegan Band, but it is also because this guy knows how to put on an excellent performance despite the slow moody feel of his music. Recommended tracks: "The Gravedigger's Song", "Riot in My House" & "Ode to Sad Disco". I just wanted to take a minute to tell you that you have a great site! Keep up the good work. ISIS Releases Album Artwork and Tracklist.